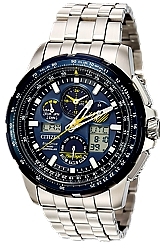 Dedicated to and Authorized by the world famous U.S. Navy Blue Angels, this special edition Skyhawk A-T Flight Computer Watch maintains its incredible accuracy because its time is snycronized every day with the Atomic Clock through radio controlled technology. 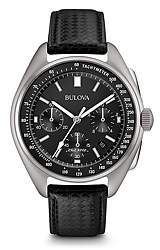 This feature packed pilot's watch has every desired function including Multiple Time Zones at the touch of a button, ZULU time, Chronograph (stopwatch), Perpetual Calendar, Countdown timer, Alarm, Power Reserve Indicator and Pilot's Rotating Slide Rule E6B Bezel. The LCD Digital functions have a Digital Backlight for easy viewing in the cockpit. Finally Citizen's legendary Eco-Drive Technology ensures you will no longer need to ever change the battery.